Neem oil is recommended as an organic insecticide and fungicide. There are a number of studies that show its effectiveness for various insect and disease problems. One of the most observable uses is in the control of powdery mildew on plants such as peonies, zucchinis and cucumbers. The picture on the left shows a peony beginning to develop powdery mildew. The claim is that neem oil can treat powdery mildew in 24 hours but my experience has been that you will see results immediately. Powdery mildew is a parasitic fungus that attaches to plants and sends down roots into the plant cells to feed. 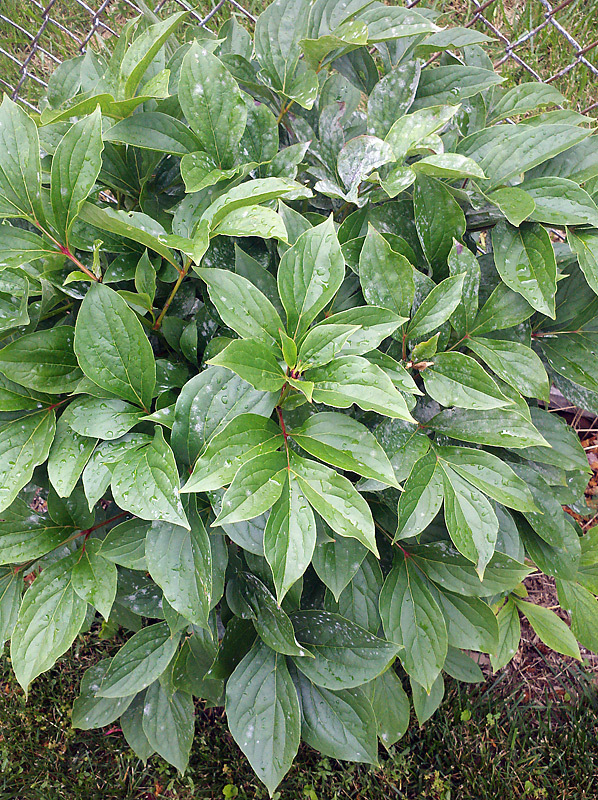 This eventually causes damage to the foliage that can be seen as yellowing of leaves, curling or black or brown spots. Powdery mildew is easy to identify because you can see a white coating on many plants, as if it was dusted with flour. This is not true of all plants. While this peony and cucumbers may show the tell-tale white coating of powdery mildew, other plants such as tomatoes may not. With other plant diseases you won't see signs of the disease itself, rather the damage it is causing to the plant. By then it might be too late to help the plant. This characteristic of powdery mildew makes it easy to determine how well neem oil works. Neem oil is made from the seed of the neem tree. Many formulations are OMRI listed or otherwise Approved for Organic Farming. Some are even EPA registered as insecticides and fungicides. In addition to controlling plant disease, neem oil can be used as an insecticide. There are a number of claims regarding how neem oil can disrupt insect hormones or otherwise repel insects but the most clear use of neem oil in my experience is as a replacement for other insecticidal soaps and horticultural oils. I have had success with neem oil using it this way against hemlock wooly adelgid, fungus gnats (see video) and other insects. 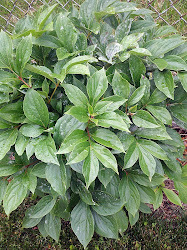 When I first noticed signs of powdery mildew on the peony above I mixed up a solution of neem oil spray and thoroughly sprayed all the surfaces of the plant liberally. I mean liberally! Get in there with your hands and spray bottle to make sure you have every surface treated. The powder mildew seemed to wash right off. Speaking of washing right off. One way to control powdery mildew is to just hose off the plant regularly before the spores attach to the plant. Normally when you think of dealing with plant fungus your first thought is to keep the plant dry but powdery mildew doesn't like wet conditions and if the spores don't stay on the leaves long enough to attach to the leaves they don't become a problem. Before spraying the above plant with neem oil I attempted to just spray it with water but it showed little difference. The neem oil on the other hand got rid of a good portion of the powdery mildew. Here is the peony again the next day. Most of the mildew was removed but on a few of the leaves it has returned or possibly the spores were too firmly attached to be removed by the neem oil. 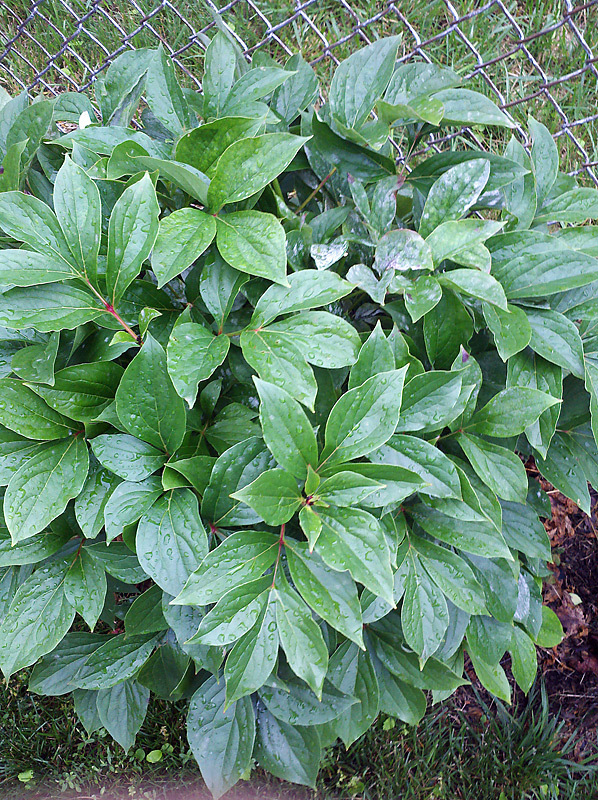 In these cases those leaves and/or stems will need to be pruned and disposed of in the trash. Do not leave diseased plant cuttings in your beds or put them in your compost pile. Just throw them out to help prevent future outbreaks of the disease. When trying to treat an active plant disease you'll need to spray the affected plants every 7 days to control powdery mildew. Keep an eye on the plants. You may need more or less frequent spraying depending on the amount of disease pressure. If you can start treating plants you know are sensitive to disease that routinely have a problem before the problem even exhibits you will have better results. This year I used BONIDE Neem Oil Concentrate because the brand I was previously using has been discontinued. Using a concentrate is more economical than using ready to use sprays. One bottle will typically last me all season and I use it for plants and lawn. In my 2 gallon pump sprayer I mix 2 oz (4 tablespoons) of neem oil concentrate with 2 gallons of water. I prefer to use the pump sprayer because the long wand makes it easy to get into the plant and treat all surfaces without a lot of squatting and bending. When I see one plant showing signs of powdery mildew I generally spray the whole garden because not all plants will show signs and other less visible diseases may be starting to develop. If I'm only going to spray a small area or single plant I'll mix 1/4 oz (1-1/2 teaspoons) of neem concentrate in a 32 oz spray bottle. Like other types of horticultural oils, it's not good to spray them in full sun on very hot days because it can harm the plants so I try to spray them early in the morning. Read and follow the directions on the label. A warning though. Neem oil has an unpleasant smell. I've sprayed all sorts of nasty smelling things in the garden including fish fertilizer and I have to say that neem oil is not something I look forward to smelling. The smell does dissipate within a day or so and it's safer to use than some of the synthetic fungicides which appear to be some of the more dangerous chemicals that are applied to lawns and gardens. You can use neem oil on chickens as well. When the weather warms up and its time for their spring bath, they get a final spray with Neem, around the vent and under the feathers, to combat lice.